A Tattered Page is opening up for it’s latest round today at Noon SL. Which is fairly soon as of this writing. The book that was the inspiration, 20,000 Leagues Under the Sea. I have to admit I had not read it before this and it was a really great opportunity to read a book that I have always heard so much about. Reading through it, the adventures… the detail, I loved it and enjoyed it very much. To be honest as I was reading it, I couldn’t decide that well on what to make. As they traveled there were references to Atlantis, sunken ruins. Underwater forests. Fish! Tons of references to food, and how this tasted or that. Hunting under the waves…. so many different things really that could have been done. I was at one point going to do a food item. Oysters. I really thought that’d be kinda fun, there’s a reference to them eating oysters. Can’t remember where at the moment, I’d have to find it. But in the end… I did something else entirely and really not anything that was conceptually within the book. 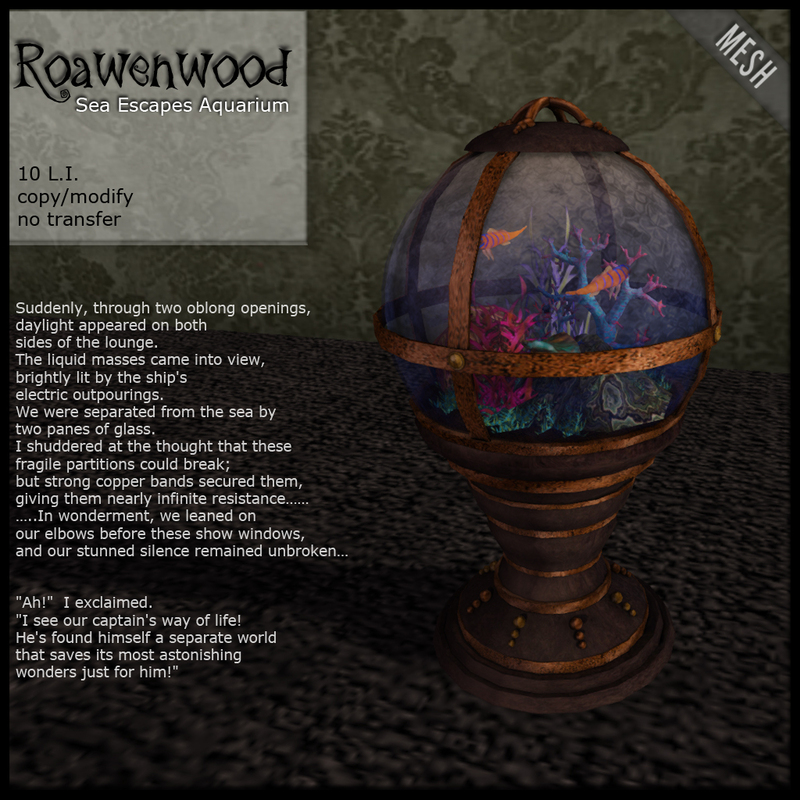 I made an aquarium, though there is a reference when the Professor says something about how an aquarium is really just a cage. Throughout the thing there tons of classifications and fish that come up, long lists. The aquarium concept has more to do with bringing a bit of the sea back home, but in my case really it’s a fascination I suppose. I love the water, have always… I had at one point wanted to work in the water as a marine biologist or something of that ilk. That was one of my first “what I want to be when I grow up” things. I used to have an aquarium in my house, and I want to get another but don’t have one at the moment. I love watching under the water. The descriptions of the Professor and Conseil staring out from the lounge for hours at a time to see the seascape. I would do the same thing. You’d have to pry me from that room. So… an aquarium, done in a rather steampunk flavor… right up the alley I think for 20,000 Leagues Under the Sea. Available now at the landing to my store and at the Tattered Page library. 10 LI total at current size, shrinking or enlarging it will impact the prim counts.